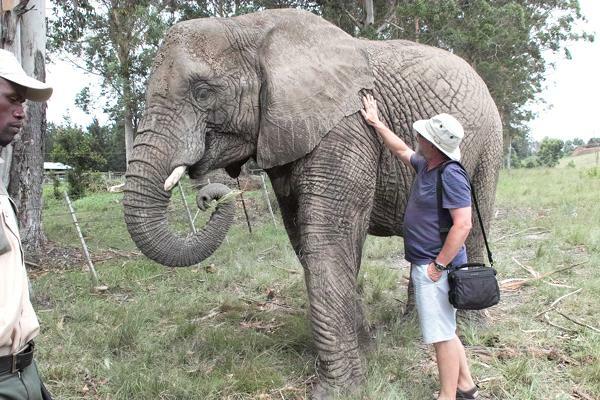 December 2012 and January 2013 will be spent land based in South Africa. Our planned trip will cover 6500 kms driving destination to destination. Sightseeing will be additional kms. Our planned route is shown on the map below. Arrival at Johannesburg OR Tambo airport, then we drive to Graskop, Dundee, Saint Lucia, Amanzimtoti, Howick, Bethlehem, Colesburg, Cape Town, Bredasdorp, Cape Aghulas, Knysna, Aliwal North, Bethlehem and back to Johannesburg for our return flight. Our flight from London to Johannesburg was cancelled after a 2 hour wait on board. A technical fault was the cause and this resulted in a very confused British Airways experience which eventually led to lots of waiting around and cross passengers. We were provided with a night in an hotel at Heathrow, a daytime flight the next day with our main meal being bacon and egg! When we arrived in Johannesburg at 1am another hotel was provided. All resulted in a whole day of the trip being lost. We collected our car from Hertz and duly trundled our luggage out to load up. On opening the boot we discovered that we could only get the smallest suitcase in it. So - back to the office to negotiate a larger vehicle. They were very helpful and provided us with a VW Polo (at extra cost of course). We also had enquired about hiring a GPS as part of the rental but at R4000 (about £250) for the duration we decided it would be cheaper to buy our own. Being reasonably familiar with where shopping areas are around Boksburg we managed to find the one I had in mind. Of course it had changed completely in 20 years but we did find the shop I had in mind and managed to purchase a Tomtom GPS for less than £100, a local Sim card and a pair of Binoculars. Some food for our first few days self catering was also purchased and then we were on our way to Graskop. GPS Kate kept us on the right road. We had to go through the toll road with 2 tolls - something we had forgotten about but luckily had enough Rand on us to pay the £10 fee. 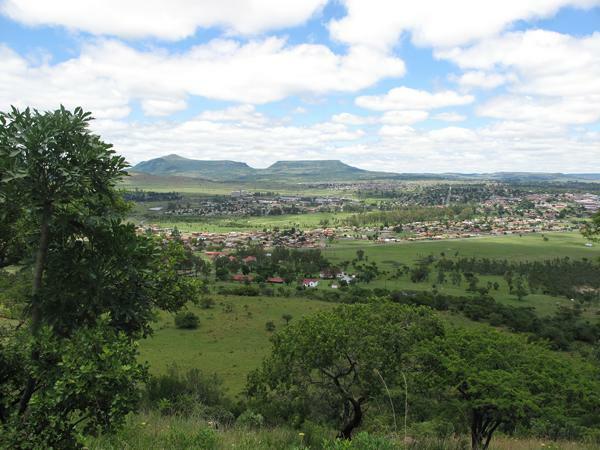 We followed the Panoramic Route and passed through Sabie before arriving at Graskop. 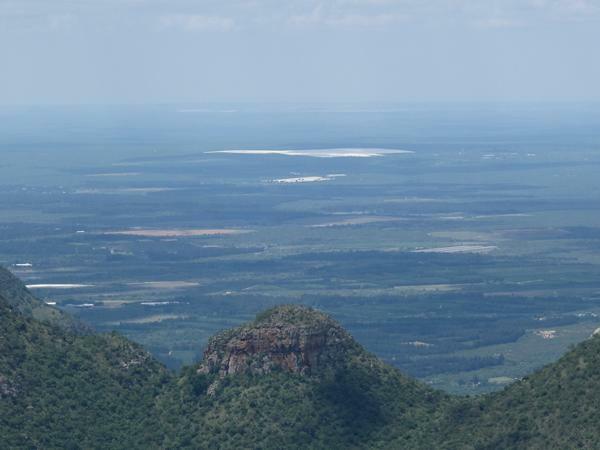 Graskop is near to the Kruger Park and also very central for visiting all the surrounding sights, although we would not be visiting the Kruger Park on this trip. We only had a slight hiccup at the actual place we were staying when the GPS told us to turn left and we ended up in the wrong part of town. I have to admit at that point that I did get a little worried about what we had booked. However we did the first of our many U-turns in the trip and found 'Daans Place' on the corner. It was clean and comfy with a full kitchen. Media player movies, a lovely lounge with big leather sofa's, internet cafe and a bar, so a couple of G&T's before dinner. 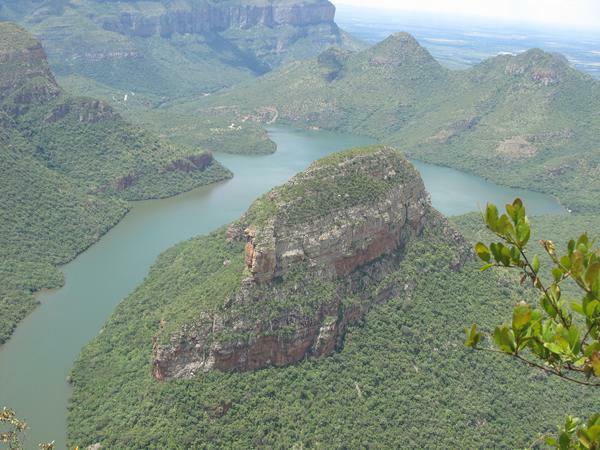 We had 3 days left for Graskop and spent our time visiting Blyde River Canyon with its stunning views, Bourkes Luck Potholes, Gods Window, the Rain Forest and The 3 Rondavels. 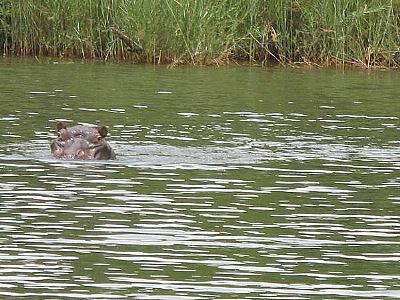 We took a 'cruise' on the Blyde River Dam viewing Hippo's up close.Our Luxury Liner was a flat decked catamaran type vessel with a railing and plastic chairs under a shade cloth. Top speed - 2 knots! The scenery is spectacular and the day was hot and sunny. 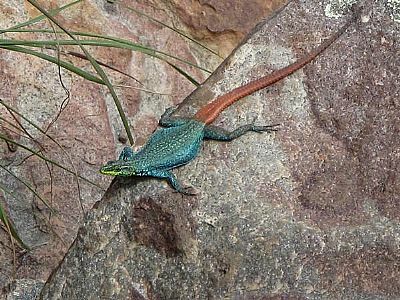 Whilst walking around the view points we were lucky to see many Lizards, Butterflies, Baboon and smaller monkeys. Heading back to our accomodation we stopped in at Pilgrims Rest. It's a pretty town which is a National Monument now however, the hawkers harrass you so much that you don't want to spend very long there. We parked the car and on our return found that it had been washed for us at a price of R60. I'm afraid we didn't have that much cash on us and, as we hadn't agreed to the wash we declined to pay - giving a much smaller tip instead. Our next stop was in Dundee where we had 2 nights to allow us one full day sight seeing. Its an interesting town where the only restaurant outside the hotel was the local Spur (steak house). Both the Spur and the Hotel closed and locked their doors at 9.30pm so no late night shenanigans were expected!. 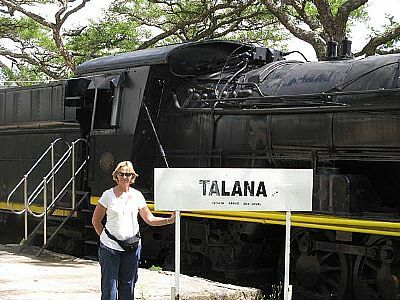 As we only had one day here we visited Talana Hill Museum. This is where the first Boer/Anglo War of the 1900's took place. The original buildings of the area were 'transplanted' to the museum grounds, including a full size steam train. We had a walk around them enjoying a step back in history and a nice lunch in the coffee shop/restaurant. 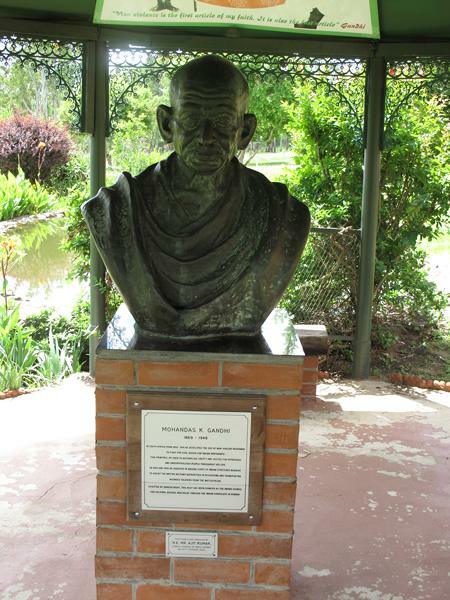 As we left Dundee we noticed the sign to the Blood River Monument so we took a detour to visit this. 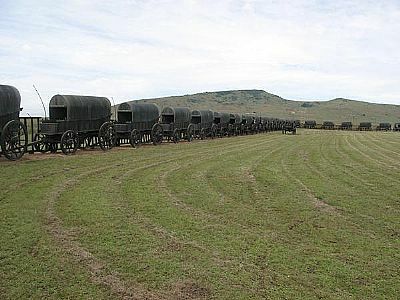 The monument is 64 life sized bronze wagons representing the original Boer configuration when they met the Zulu's on the banks of Blood River. A very good informational video is part of the entrance fee. It reminded us a little of the American Wild West though. We couldn't visit the Zulu Monument across the river as there had been a lot of rain and the entrance was flooded. From here we took the mountain road through some very rural parts and eventually back on to the highway to take us into Natal and Saint Lucia. We spent time in Saint Lucia visiting the Lagoon and the town. At dinner we sat on the restaurant terrace in the hope of seeing the hippo's that walk freely through the town in the evening, but they didn't want to be seen that night. 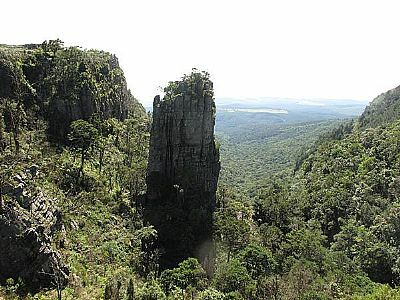 A day spent driving through Cape Vidal Nature Park was well worth the effort. 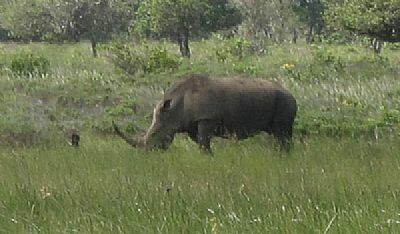 We saw lots of wildlife and, in the evening watched the Buck stroll through the B&B garden to the water hole. 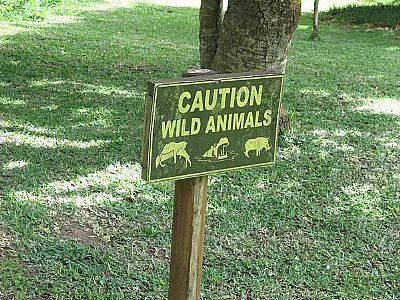 (The hippo's didn't oblige during our visit but apparently they frequent the garden in the evening). 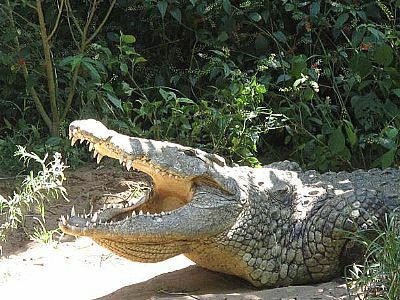 Before leaving Saint Lucia we visited the Crocodile Park to have a 'chat' with some very large Crocs. Needless to say there wasn't much back-chat as it was so hot they just lay there with their mouths open! We spent time in the hubbub of Amanzimototi and Umhlanga watching the locals on summer holidays. It was busy, busy and hot, hot! Some souveniers were purchased at the Gateway Shopping Mall with a good meal at SherJo in Umhlanga (a lovely pasta). It was around these areas that we started to see signs on the side of the highways advising drivers to 'Beware of Pedestrians'. We wondered what you do if you are travelling along in busy traffic, on a 3 or 5 lane highway, at 120 km/hour when a pedestrian suddenly walks in front of you? As we drove from Unhlanga to Amanzimtoti we saw the results - under one of the flyover bridges the police had covered a body with a blanket! 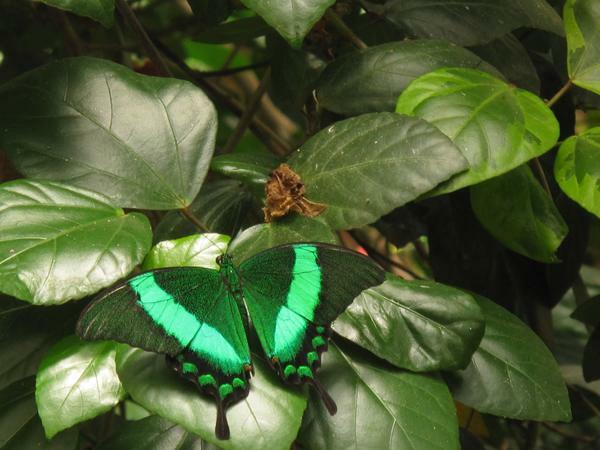 On our way north from Durban we visited the Butterfly House in Pietermaritzburg. Its a lovely place to visit and as you walk through the avary the butterflies flit from flower to flower, often landing on the visitors as you pass by. 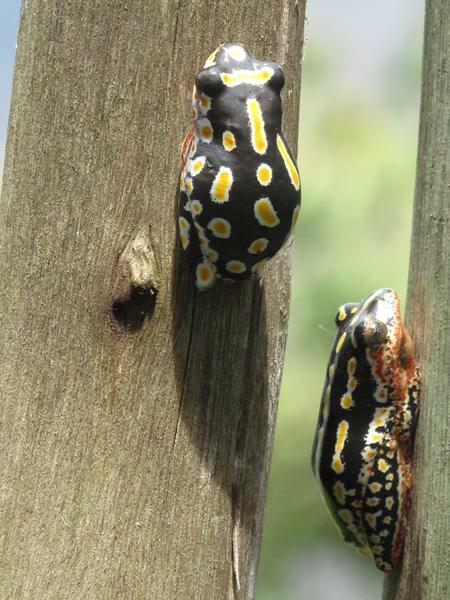 We decided to visit as we had hoped to identify some of the many beautiful butterflies we had seen on our travels. Then on to Howick with two nights at a wonderful B&B on a farm, which saw us enjoying our first swim of the holiday in the pool. 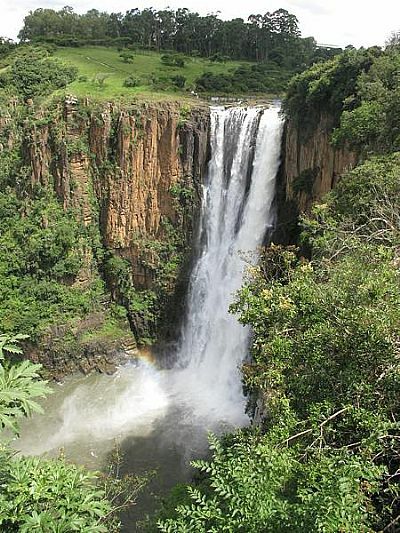 Stunning waterfalls at Karkloof and Howick Falls gave us lots of photo opportunity. A wonderful Jambalaya at '68 on Main' for our meal on the night of our arrival. We really enjoyed '68 on Main' as the food is really good and the bar has an almost English style Pub atmosphere. 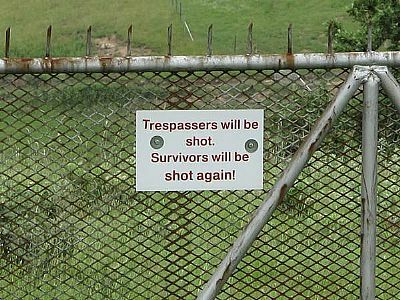 Unfortunately we couldn't visit the MidMar Dam as we didn't have enough cash on us for the entrance fee. 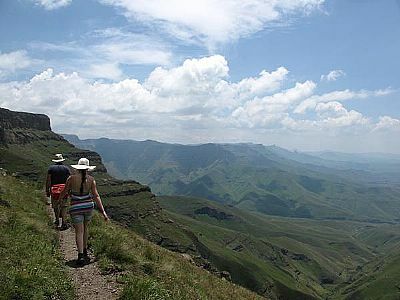 On our way to the Free State we took the Midlands Meander Route which took us through lovely green scenery and on up to the Drakensburg Mountains before crossing over to Harrismith and back onto the tar roads leading to Bethlehem. We did get a little lost - or off-course - on our way but soon found our way back to the main road. GPS Kate was starting to irritate us so we changed to GPS James who gently directed us the rest of the way to Bethlehem. Christmas was spent with family in Bethlehem - 20 of us for Christmas day. The weather however didn't accomodate us so we spent the day indoors while it poured all day. Some drying off of tents and bedding was required too. It was a good time for catching up on old stories and hearing some new ones. The family headed back to Johannesburg on Boxing Day and the sight seeing continued for us with a trip to Clarens where we stuck our heads into every shop and enjoyed lunch at the Clarens Brewery. pic: GPS position and elevation in the car park - before we started walking! 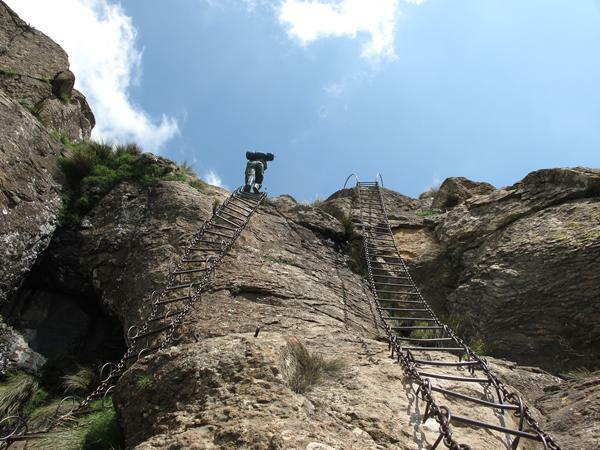 then walked 9 kms, ascending a further 500 metres before having to climb another100 metres up the first of two vertical chain ladders which take you over the cliff top to the falls. 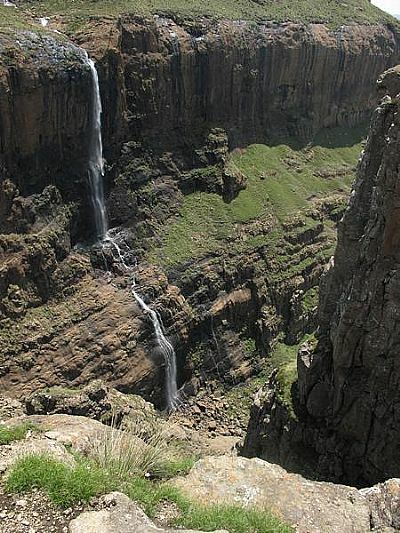 Tugela Falls is the world's second highest waterfall. The total drop in five free-leaping falls is 948 m (3,110 ft). The ladders were a unique experience which not all of us are cut out for! Fortunately the day was hot but at Sentinel Peak the cloud cover kept us from burning and by the time we came back down again in the late afternoon the worst of the heat had passed. Pic: Sentinel Peak - but how do we get up there? Predictions of severe thunderstorms in the locale, with hail and high winds, had us worrying a bit for a family group with 6 or 7 children who were camping out at the top of the falls over the New Year period (protected by armed park wardens!). January was spent in the Cape Province. 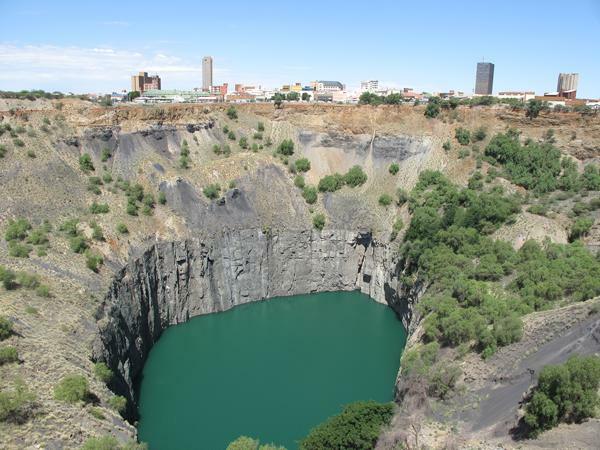 We left Bethlehem and headed west to Kimberley where we visited the 'Big Hole Museum'. The museum was very well executed and we enjoyed the day. 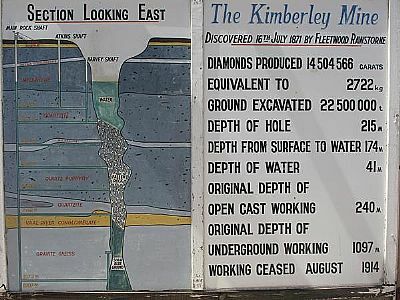 Part of the museum visit is a trip underground which was very effective. The lift ride gave the impression of travelling deep under the earth - the reality is that we only went down 5 metres to the ground floor! Again, the original buildings form part of the museum and it was great fun walking through a time in history, peering in all the windows and seeing life as it was. The next day we set out on the long trip to Cape Town. 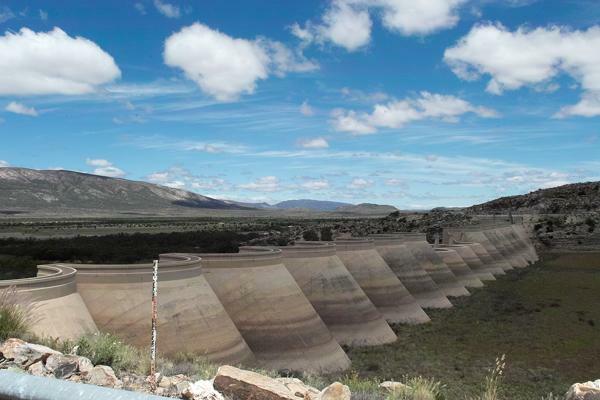 A stop in Colesburg was planned to break up the 1400 km trip. 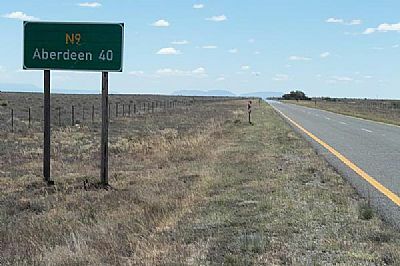 Our GPS wanted to take us along the highway to Colesburg but we decided to take a 'dirt' road when we saw a sign to Colesburg much earlier than the GPS turn-off. The first section of the road was a bit damaged with us driving along what felt like an old fashioned 'washboard' .It was an excellent drive with no traffic and we didn't mind the bumps and dust. The road took us alongside a nature reserve which afforded us some good views of wildlife that we would otherwise have missed. 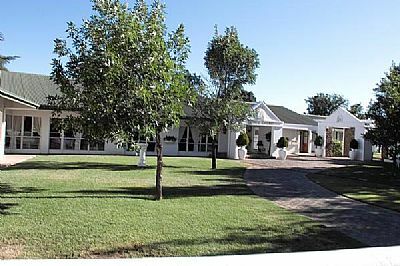 Our B&B for the night was great with a nice dinner in their in-house restaurant after a walk to the local shop for some wine, which we enjoyed on our stoep watching the sun set. 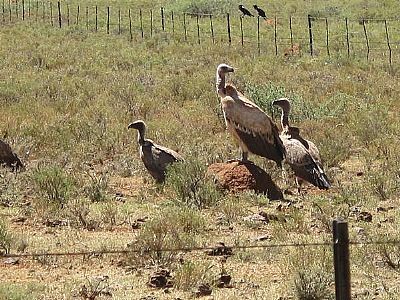 pic: Vultures at the side of the road - waiting for dinner? 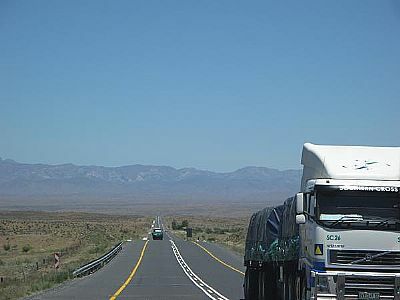 The drive from Colesburg to Cape Town took us 10 hours down the N1 Highway and through the Karoo desert. We had a small detour at De Doorns where the highway had been closed by the farm worker swho were striking for a pay increase. They wanted a rise from R85 a day to R150 - that £7.50 a day to £10 a day! Earlier in the week there had been some violence but we didn't see anything although there was a high Police presence. We arrived in Constantia about 5pm, in time for unpacking, shopping and some 'Feesh and Chips' at Ocean Basket. Next day we met up with the HLR from the Cruising Association and enjoyed a lovely lunch with them at the Royal Cape Yacht Club. Thank you Adrienne and Alan. We had 10 days in Cape Town and we spent our time visiting the V&A Waterfront; Table Mountain; Red Sightseeing Bus trip; Rhodes Memorial; Kirstenbosch Gardens; Cape of Good Hope; Cape Point; Fish Hoek; Simon's Town; shopping at Century City; Chapman's Peak;Groot Constantia Wine Cellars; Cape Columbus (most westerly point of Cape Province) and Paternot (a lovely seaside village) via Langebaan, Mykonos and Darling. We found Atlantis - very much a lost city - but not somewhere you would want to visit! 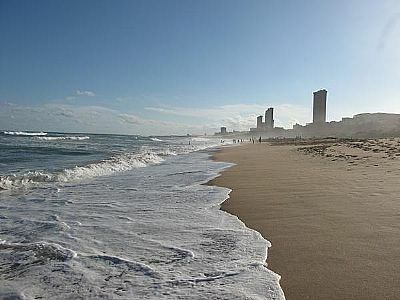 pic: Atlantis - the lost town of! 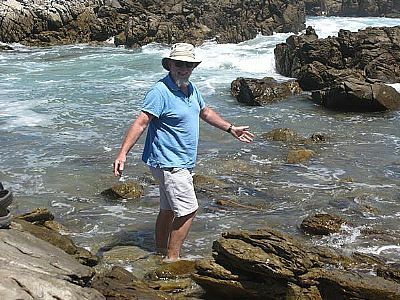 We did various road trips while in the Cape, including Noordhoek, Hout Bay, Fish Hoek, Simon's Town, Bellville, Durbanville, Tableview and others. A visit to Snoekies in Fish Hoek for fresh fish and chips was called for. The last time I ate here was in the early 90's when the eating area was outside, covered over with a net to stop the seagulls from stealing your food! In 2013 the eating area is enclosed - not quite the same atmosphere. 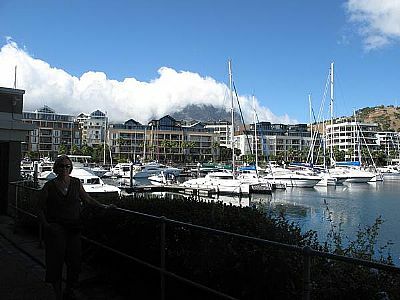 pic: V&A Waterfront with Table Mountain in the background under the tablecloth. Our trip on the Wine Route took us back into the mountains to Stellenbosch (where we spotted school childred in their Boaters), Paarl and Franschoek. We really enjoyed Franschoek where we did some more souvenier shopping after enjoying a lovely lunch - a huge hotdog! The town has lots of coffee shops/bistro's and restuarants along the main street which were very busy. On our way back to Cape Town we took the drive through the Franschoek Pass, Elgin, Grabouw and down the St Lowry's Pass. The landscape consisted of Fruit farms as far as the eye could see amongst the hills. 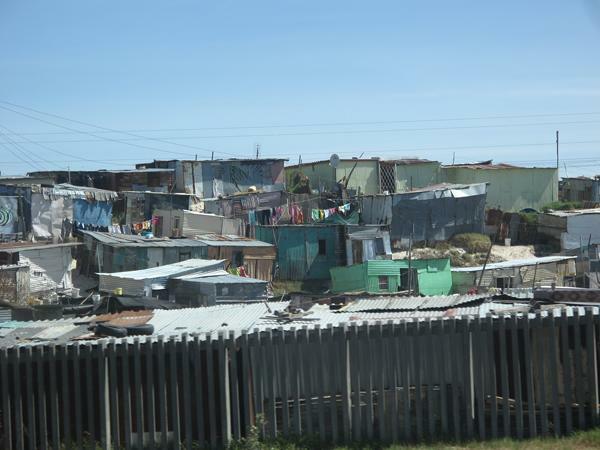 Once back on the highway our route afforded us views of Khayelitsha, Nyanga and Mitchells Plain. 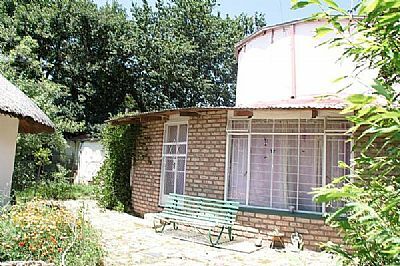 Whilst these are areas which inspire artists who sell their wares all across South Africa, we found these very distressing areas to view. Even more so as the local Cape Politician had announced the previous night that 99% of all Cape province populus had access to electricity and running water. This clearly wasn't what we were seeing! 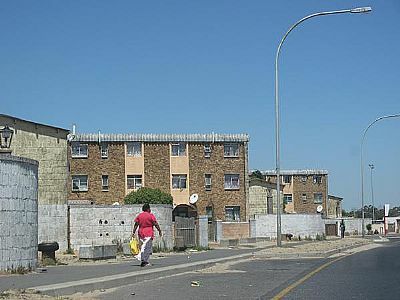 pic: Khayelitsha Homes alongside the N2 at Cape Town. We ended our time in Cape Town enjoying the Theatre - a live performance of David Kramers 'Kalahari Karoo Blues' at the Baxter Theatre. Our last night was marked with dinner at Peddlars on the Bend restaurant. 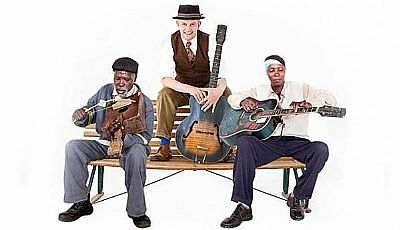 pic: David Kramer Kalahari Karoo Blues - courtesy of The Baxter Theatre Website. The next leg of our journey was to Knysna, along the coast to the east. We stopped off at Hermanus for morning coffee before driving through Gansbaai to take the dirt road to L'Agulhas. 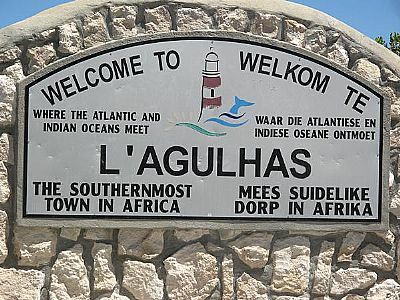 L'Agulhas is the most southern point of Africaso we had to visit it. Our original plan to sail to South Africa included sailing around Cape Agulhas so, as we were not sailing we had to visit by car. 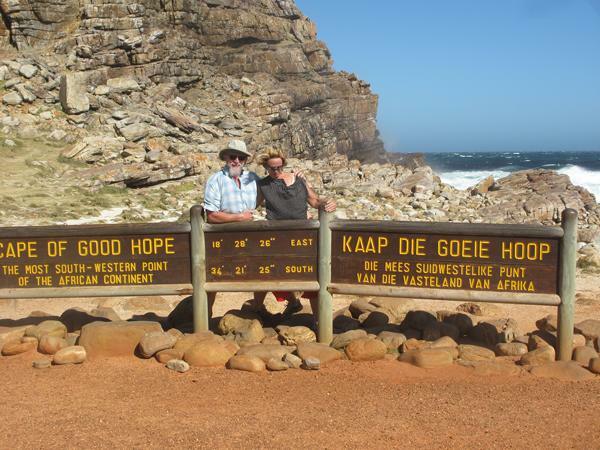 We thought that the area would be quite mountainous, barren and windy - a bit like the Cape of Good Hope and were surprised to find that its quite a flat area. The town is very pleasant with some really large homes overlooking the ocean. We walked along the boardwalk from the car park to the monument marking the actual most southerly point of land and had a paddle in the ocean - very cold. Back in the village we stopped off for some fresh Line Fish - Yellowtail - for lunch before heading inland to Bredarsdorp for our overnight stop. 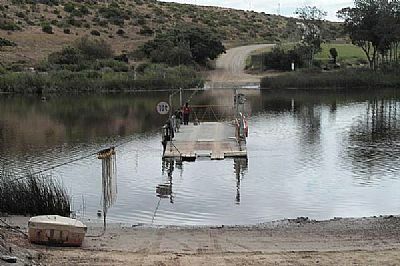 Next day we drove to Malgas where we had read there was a ferry across the Breede River. We couldn't find Malgas on the GPS so resorted to the paper map. The road signs on our way were a bit confusing as they were alternatively directing us to Malgas and then Malagas. We figured we would just keep going and would eventually get there. On arriving at the ferry we found it was the last remaining manual Pont in South Africa. Its a flat pont which holds 3 cars (maximum 10 ton) and is pulled across the river on a cable by three men who wear a harness with a chain attached which they throw round the cable and then 'walk' the ferry across. A bit more dirt road before we hit tar and drove on the highway to Knysna. After checking in at our B&B we went into the town and found the Knysna Yacht Club where we invited ourselves in and enjoyed a drink with the club members. Dinner at Mo's on Rex was the best plate of Calamari I have had in a long, long time. Next day we had to decide between a trip on a Catamaran or Yacht out of the lagoon into the Ocean, or a visit to the Elephant Park. The elephants won and we spent the morning feeding elephants by hand then walking amongst them scratching their ears and having a 'chat' with them. After lunch we drove back to Knysna and visited the view points at the Knysna Heads before a swim in the pool, some more souvenier shopping and dinner at 34 Degrees South where the beer temperature is advertised as 4 degrees and the Ostrich Steak is delicious. 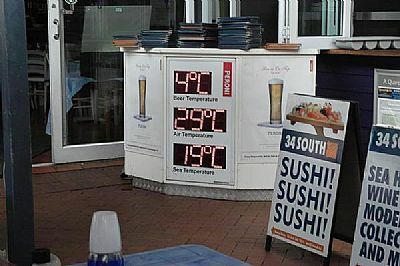 pic: 34 Degrees South - with all the important temperatures listed. Our trip continued the next day - heading north and inland. 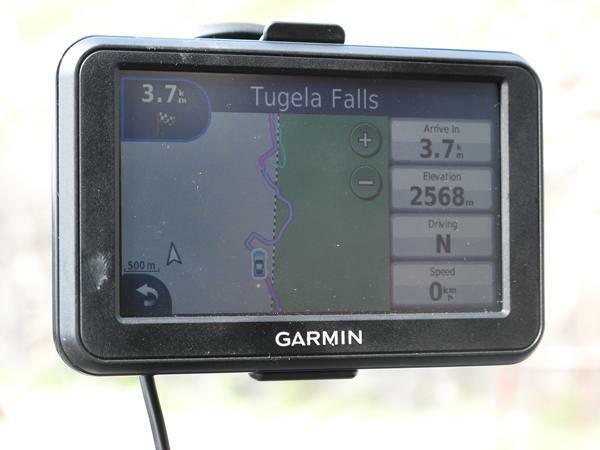 Again the GPS wanted to take us on the highways but we had studied the map and decided on the mountain route through the Prince Alfred Pass before joining the highway at Uniondale. The route was very mountainous with the climb up being done in the mist. It was very damp as it had rained overnight so the road was quite muddy - I felt a bit like a rally driver as I slid round the corners and wheelied on the steep parts! We eventually came out at the top where it was much drier and the roads were better. We slowed down a bit to let the Baboons and their babies cross the road while we took some pictures of the magnificent scenery, along with road signs that made us glad to be there in summer. Around one bend we came across a Dam Wall - with no water. We researched it later and found it is called the Beer Dam and is used only at times of extreme rainfall when the plains flood. Our overnight stop was to be in Aliwal North. 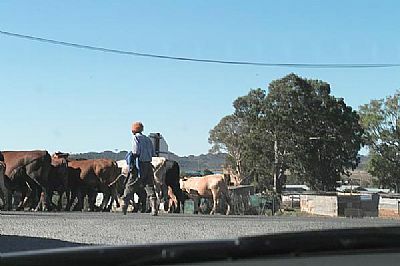 On the way there we drove through Middleburg, Burgersdorp and Steynsburg - all of which would once be classed as 'one horse' towns and are now sorely neglected. At one point we thought we were lost and had been transported back to the UK - Aberdeen here we come! pic: Aberdeen? Are we lost? Our accomodation for the night was old-fashioned but clean with a nice pool. We had a swim to cool off as the temperature was around 35 degrees C at 7pm, then ordered our dinner from Steers. The hotel kitchen was closed as there were not enough guests (understatement). Overnight the electricity went off with a huge explosion so, in the morning, we had no airconditioning or hot water. The hotel managed to serve us breakfast as they were cooking on gas, but we were the only ones there so it was a bit surreal - almost Physcho-ish. Fortunately we had enough cash to pay as, with the power being off, their card machine wasn't working. We were concerned that it was the whole town that had lost its power as we needed petrol, but fortunately it was only the area the hotel was in. It was back to Bethelehem then for a few days. We had a good drive as far as Zastron where the road turned to potholes. These were huge - stretching across the width of the road and some so deep you would lose your car in them! The countryside was very green after the recent rain and the farm dams were all full. The road took us along the border of Lesotho. 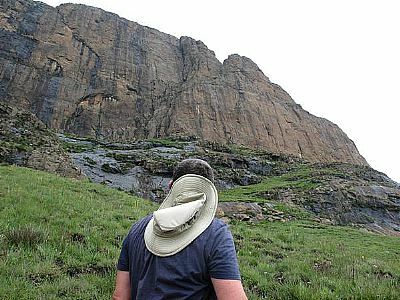 We had made an early decision not to visit Lesotho, based on the tourist information provided on-line by the UK and the USA government travel information, but the scenery was spectacular. Over the weeks we have found the one thing to unite all South Africans - not matter their colour, creed, gender or religion. This is a place called 'Pit-O-Lees'. 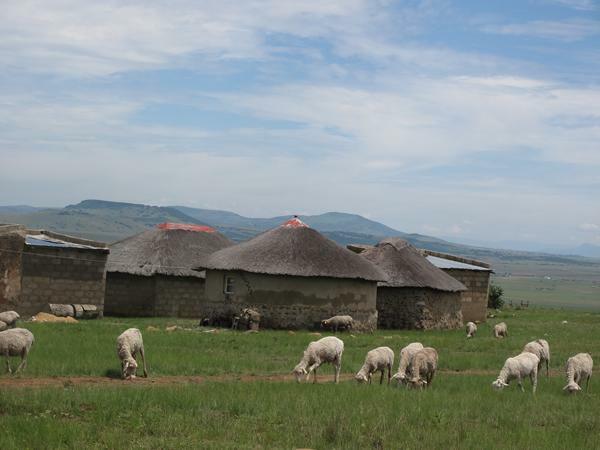 It is a place found all across South Africa but in particular in the Free State. They are well marked with frequent signs along all routes. Its the one place that no-one in the country wants to be, and the one place that everyone avoids and is united on how it should be dealt with. 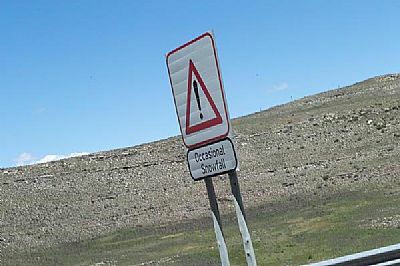 The road signs are usually mis-spelt and call this place POTHOLES. Packing was done and redone the night before we left Bethlehem. Our clothes eventually went into vacuum bags to reduce bulk and what started the trip in two bags fitted into one bag! The drive to OR Tambo airport in Johannesburg was uneventful. We returned our car to Hertz and noted that we have travelled 10147 kms. The flight home went without too much issue. Peter's TV monitor wouldn't work properly so after much too-ing and fro-ing the Purser moved us to World Traveller Plus with big reclining seats. At Lisbon we managed to change our flight to Madeira to an earlier one which allowed us to arrive home at 5.30pm instead of the scheduled 11.45pm. We have spent 7 weeks travelling. We enjoyed the country and the experiences we had there. It was lovely to catch up with family and friends that we hadn't seen for some years and to make new friends. The scenery was amazing and the people were friendly and helpful. The weather was hot with temperatures in the high 20's and mid 30's most of the time. We were fortunate that the summer storms seemed to arrive in areas after we had left. It is nice to be back in Madeira where we will now take our time in getting Red Ruth ready to put back in the water in a few weeks.